OK, so it’s been a while since the last installment in this series. I had talked about how we’d brought Scrum to our operations team, which worked fine, and then added in the developers as well, which didn’t. Our first attempt at dividing the whole product up into four integrated DevOps service teams collapsed quickly. Here’s how we got past that to do it again and succeed, with a fully integrated DevOps setup managing both proactive/project/feature work and reactive/support/tactical work in an effective way. The first challenge we had was just that I couldn’t manage four new scrum teams totally on my own. We had gotten the ops team working well on Scrum but the development team hadn’t been. We didn’t have any scrum masters other than me, and were low on people designated as tech leads as well. So step one, we just mushed everyone into a 30+-person Scrum team, which sucked but was the least of the evils, and I immediately worked on mentoring people up as both Scrum masters and tech leads. I basically led by example and asked for volunteers for who was interested in Scrum mastering and/or being a tech lead for each of the planned sub-teams. This was interesting – people self-selected in ways I would not have predicted. Some of the willing were employees and others were contractors – fine, as far as I’m concerned. “From each according to his ability, to each according to his need.” I then maximally had them start to lead standups and take ownership over sprints and such, coaching them in the background. In that way, it only took a little while to re-form up into those four teams. This gave some organic burn-in time as well, so that the ops folks got more used to not being “the ops team” and leaning on people that were supposed to be on other sprint teams. As I empowered the new leaders this became self-correcting (“Stop working with that other guy on their stuff, we have things that need doing for our service!”). The second and largest problem was managing the work. We had practically zero product manager support at the beginning, so it was up to us to try to balance planned work from many sectors – feature requests from PM, tooling requests from Customer Service and Technical Support, security stuff from Security, random requests from Legal and Compliance, brainwaves from other products’ engineering managers. It quickly began to take a full person worth of time to handle, because if not managed proactively it turned into attending meetings with people complaining as a reactive result. I went to the PM team and said “come on man, give us more PM support,” and once we got one, I worked with her on being able to manage the whole overall package. For the record, that’s not OK. As a product manager, you need to be able to balance all the work against all the work. Maybe you don’t have an ops background, that’s fine – you probably didn’t have a <business domain here> background when you came to work either. Learn. A lot of the success of a SaaS product is in the balancing of features against stability/scalability work against compliance work… If you want to take the “I’m the CEO of the product” role, then you need to step up and own all of it, otherwise you’re just that product’s Director of Wishful Thinking. Anyway, luckily our PM, even though she didn’t have experience doing that, was willing to learn and take it on. So we could reason about spending a month putting in a new cluster versus adding a new display feature – they all went into the same roadmap. We kept each service as one JIRA project but combined them into rapid boards as necessary – a given team might own a couple (like the “Workbench and CMS Team” had those two and a smaller tooling one). This way when we transferred a piece of tech around we could just move the JIRA project as well, and incorporate it into the target team’s rapid board. Some people say that the ideal world is each team owning one microservice. I don’t agree with this – we had a number of teams under other parts of the org that were only like 2 people because they owned some little service. This was difficult to sustain and transition; when things like Black Friday came up that required 24×7 support from each team for a week it was brutal on them, and even worse once development eased up on a service it just got orphaned. So for my teams, we put together a tracking list, used both as a service registry but also for cross-training. It was a simple three-level outline, with major services, service components, and low level elements. We had the whole team work together on filling out the list – since we were managing a 7-year-old legacy system we ended up with a list of 275 or so leaf items. Every one had to have an owning team (team, not individual), and unless you retired a service, there was no dropping it on the floor. You owned it, you retired or transitioned it, and I didn’t care if “the dev that worked on that moved to some other team.” Everything was included, from end user facing services like “the user portal” to internal services like our CI servers. This transitions into how we managed the teams. Teams were standard “two-pizza size” – a team of 5-7 people is optimal and we would combine services up till there was enough work for a team of that size. This avoided the poor coverage of mini-teams for micro-services. Then we also used the service registry as the “merit badge system.” We had a simple qualification procedure – to get qualified in an element, you had to roll out code on it and you could sign off for yourself to say that you were qualified on one of those leaf elements. To get your “merit badge” in a service component, you needed an existing subject matter expert (SME) to sign off that you knew what you were doing, and you needed to understand how the service was written, deployed, tested, monitored. To become a SME in a service, the existing SMEs would have a board of review. SMEs were then understood to be qualified to make architectural changes on their own initiative, those with merit badges were understood to be qualified to make code changes with nothing more than the usual code review and CI testing. This was very important for us because we were starting in a place where people had been allowed to specialize too much. Only one person was the SME on any given service and if the person who didn’t understand the Workbench was out, or quit, or whatever, suddenly no one knew a whole lot about it. That’s a terrible velocity burden even without attrition and it’s a clear and present danger to your service’s viability when there is. We started tracking the “merit badges” and had engineers set goals around how many they’d earn (or how many they’d review, for the more experienced). We used a lot of contract programmers and I told the contractor manager that I wanted to use that to rate the expertise of people on our account and that I wanted to see the numbers rise on each person over time. Our team was only doing planned work 40% of the time, however. Since we were integrated DevOps teams working on a service with thousands of paying end customers, and that service was custom-integrated with customer Web sites and import/export of customer data, there was a continuous load of work coming in from Customer Support and from our own operations (alerts, etc.). All this “flow” work was interrupt-driven, and urgent to one degree or another. The usual techniques for handling this have a lot of problems. “Let’s make a separate sustaining team!” Well, this turns into a set of second class developers. Thus you get worse devs there on that team. And those devs are more utilized one week, less the next; when things are quiet they get seconded to other efforts by people that haven’t read the Principles of Product Development Flow and think having everyone highly utilized is valuable, and then the load ramps up and something gives… Plans emerge to make it a training ground for new devs, till you realize that even new devs don’t want to put up with that and just quit… I’ve seen this happen in several places. I am a firm believer in dog fooding – if you are writing a service, you need to handle its problems. If there are a lot of problems, fix it!!! If you are writing the next version of the service – well, doing that in isolation from the previous service dooms you to making the same errors, adding in some new ones as well. No sustaining teams, only evergreen teams. In addition to the teams’ daily standups, we had a daily triage meeting where the engineering manager, team leads, PM, and representatives from Support, Sales, and whoever had a crisis item that they felt needed to be handled on an expedited basis (not waiting on the next sprint, in other words) would come to. Each new intake would be reviewed. In the beginning we had to kick a lot of requests back for insufficient detail, but that corrected itself fast. We’d all agree on priority – “that’s affecting one customer but they’re one of our top customers, we’ll work it as P2” or the like. For customer reported issues, we had SLAs we committed to in contracts (1 day for P1, etc). Ops issues could be super urgent – “P1, one of our services is down!” – or doable later on. So what we did was to create a separate Kanban board in JIRA for all these kinds of issues. Anything that really could wait or was large/long term would get migrated into the Scrum backlogs, but anything where “we need someone to do this stat” went in here. It served the same purpose as an “expedite lane,” it was just a jumbo four-lane highway of an expedite lane because so much of the work was interrupt driven. But does this mean “give up on Scrum?” No. Without the sprint cadence it was hard to hit a release cadence, and also it was easy for engineers to just get lost in the soup and stop delivering at a good rate, frankly. So we still ran sprints, and here was the rules of engagement we provided the engineers. If there’s nothing in the sprint backlog or the triage queue, pull something off the top of the backlog. Or relax, either one. Then for standups, we had a master Agile board that contained everything – all projects, the triage board, everything. So when you looked at a given engineer’s swimlane, you could see the sprint work they had, the flow work they had, and anything they were working on from someone else’s project (“Hey, why are you doing that?”). Again, via JIRA agile board composition that’s easy to do. Sometimes teams would try to do standups just looking at swimlanes containing “their” projects and it always ended up with things falling in the gap, so each time that happened I reiterated the value of seeing everything that person is assigned, not just what you think/hope they are assigned, since they are exclusively attached to that one team. At first, everyone fretted about the conflict between the flow work and the sprint work. “What if there’s a lot of support work today?! ?” But as we went on sprint by sprint, it became evident that over the course of a two week sprint, the amount of support and operations work evened out. Sprint velocity was regular despite the team working flow work as well. Having full-sized sprint teams and two-week iterations meant that even if one day there was a big production issue and whoever grabbed it was slammed – over the rest of the time and people it evened out. This shouldn’t be too surprising, it’s called “flow” for a reason – there are small ebbs and surges but in general the amount over time at scale is the same. Was it as perfectly “efficient” as having some people working flow and others working sprints? No, there is definitely a % overhead that incurs. But maximum utilization of each person’s time, as I mentioned before, is a golden calf. Lean principles show us that we want the best overall outcome – and this worked. Flow work was addressed quickly, and our customer ticket SLA attainment percentage whipped up from a starting level of less than 50% over several quarters to sit at 100%, meaning every single support ticket that came in was addressed within its advertised SLA. Once that number hit 100% the support ticket time to live started to fall as well. At the same time, sprint velocity for each of the four sprint teams went up over time – that is, just the story points they were delivering out of the feature backlog improved, in addition to the improvements in flow work. We’d modify the process based on engineer feedback and try alterations for a sprint to see how they panned out, but in general by keeping the overall frame in place long enough that people got used to it, they became more and more productive. Flow work and planned work both improved at the same time, not at each others’ expense. This scheme had two issues. One was that engineers were sometimes confused about what they should be working on, flow tickets with SLAs or their sprint tasks. Our Scrum masters were engineers on the teams too, they weren’t full time PMs that could afford to be manually managing everyone’s work. The second was that operational issues that came in and required sub-day response time couldn’t wait for triage and ended up with either frantic searches for anyone who could help (which often became “everyone sitting in the team area”) or missed items. I have always been inspired by Tom Limoncelli’s Time Management for System Administrators. He advocates an “interrupt shield” where someone is designated as the person to handle walkups and crises. At NI I had instituted this in process, at BV in the previous Ops team there had been a “The Dude” role (complete with Jeff Bridges bobblehead) that had been that. Thus the Dynamic Duo were born. This was good because it blunted the sharp tip of very urgent requests. The remaining flow work (2 people couldn’t handle the 60% of the load that was interrupt driven) was easier for the sprinting devs to pull in as they finished sprint tasks without worrying about timeliness – the real crises were handled by the Dynamic Duo. The Duo also ran the triage meeting and even if they weren’t working on all the triage work, they bird dogged it as a kind of scrum/kanban/project manager over the flow work. In the rare case there wasn’t anything for them to jump on, they could slack – time to read, learn, etc. both as compensation for the oncall and adrenaline rushes that week but also because it’s hard to fit time for that into sprints… And as we know from the Principles of Product Development Flow, running teams at too high of a utilization is actually counterproductive. That’s the short form of how we did it – I wanted to do a lot more but I realized that since it’s been a year since I intended to write this, I’d better shake and bake and get it out and then I’m happy to follow up with stuff any of you are curious about! Improvement of all these factors was not slight, but was instead 50% or more in all cases. Feel free and ask me about parts of this you find interesting and I’ll try to expand on them. It wasn’t as simple as “add Agile” or “add DevOps,” it definitely took some custom wrangling to balance our specific SaaS service’s needs in the best manner. Welcome to the newest article in Scrum for Operations. I started this series when I was working for NI. But now I’m going through the same process at BV so time to pick it back up again! Like my previous post on Speeding Up Releases, I’m going to go light on theory and heavy on the details, good and bad, of how exactly we implemented Agile and DevOps and where we are with it. Here at BV (Bazaarvoice), the org had adopted Agile wholesale just a couple months before I started. We also adopted DevOps shortly after I joined by embedding ops folks in the product teams. Before the Agile/DevOps implementation there was a traditional organization consisting of many dev teams and one ops team, with all the bottlenecking and siloing and stuff that’s traditional in that kind of setup. Newer teams (often made up of newly hired engineers, since we were growing quickly) that started out on the new DevOps model picked it up fine, but in at least one case we had a lot of culture change to do with an existing team. Our primary large legacy team is called the PRR team (Product Ratings and Reviews) after the name of their product, which now does lots more than just ratings and reviews, but naturally marketing rebranding does little to change what all the engineers know an app is called. Many of the teams working on emerging greenfield products that were still in development had just one embedded ops engineer, but on our primary production software stack, we had a bunch. PRR serves content into many Internet retailer’s pages; 450 million people see our reviews and such. So for us scalability, performance, monitoring, etc. aren’t a sideline, they’re at least half of the work of an engineering team! This had previously been cast as “a separate PRR operations team.” The devs were used to tossing things over the wall to ops and punting on the responsibility even if it was their product, and the ops were used to a mix of firefighting and doing whatever they wanted when not doing manual work the devs probably should have automated. I started at BV as Release Manager, but after we got our releases in hand, I was asked to move over to lead the PRR team and take all these guys and achieve a couple major goals, so I dug in. I actually started implementing Agile with the PRR Ops team because I managed just them for a couple months before being given ownership of the whole department. I had worked closely with many of them before in my release manager role so I knew how they did things already. The Ops team consisted of 15 engineers, 2/3 of which were in Ukraine, outsourced contractors from our partner Softserve. At start, there was no real team process. There were tickets in JIRA and some bigger things that were lightly project managed. There was frustration with Austin management about the outsourcers’ performance, but I saw that there was not a lot of communication between the two parts of the team. “A lot of what’s going bad is our fault and we can fix it,” I told my boss. Bryan D – did: Hosted SEO 2.0 discussion may require Akamai SSL, Tim’s puppet/vserver training, DOS-2149 BA upgrade problems, document surgical deploy safety, HOST-71 lab2 ssh timeout, AVI-790, 793 lab monitoring, nexus errors; will do: finish prep Magpie retro, PRR sprint planning, Akamai tickets for hosted SEO, backlog task creation. For context, while this was going on we were planning for Black Friday (BF) and executing on a large project to shard our Solr indexes for scaling purposes. The standup itself brought loads of visibility to both sides of the team and having the emails brought a lot of visibility to managers and stakeholders too. It also helped us manage what all the outsourcers were doing (I’ll be honest, before that sometimes we didn’t know what a given guy in Ukraine was doing that week – we’d get reports in code later on, but…). I took the notes in the standup straight into an email and it didn’t really slow us down (I cheated by having the JIRA project up so I could copy over the ticket numbers). Because of the number of people, the Webex, and the language barrier the standups took 30 minutes. Not the fastest, but not bad. After everyone got used to the standups, I introduced a backlog (maybe 2 weeks after we started the standups). We had JIRA tickets with priorities before, but I added a Greenhopper Scrum style backlog. Everyone got the value of that immediately, since “we have 200 P2 tickets!” is obviously Orwellian at best. When stakeholders (my boss, other folks) had opinions on priorities we were able to bring up the stack-ranked backlog and have a very clear discussion about what it was more or less urgent/important than. (Yes, there were a couple yelling matches about “it’s meaningless to have five ‘top priorities! '” before we had this.) Interrupt tickets would just come in at the top. All the usual work… just in a list. “Work it from the top!” We still had people cherry-picking things from farther down because “I usually work on builds” or “I usually work on metrics” but I evangelized not doing that. This helped engineers focus on what they were supposed to be doing, and encouraged them to put interrupts into the queue instead of thrashing around. Once we had the backlog, it was time to start sprinting! We had our first sprint planning meeting in October and I explained the process. They actually wanted to start with one week sprints, which was interesting – in the dev world often times you start in with really long (4-6 week) sprints and try to get them shorter as you get more mature. In the ops world, since things are faster paced, we actually started at a week and then lengthened it out later once we got used to it. However, I learned two things doing all this. The first is that for our team at least, the lion’s share of the work was proactive, not reactive, especially if you use a 1-2 week lookahead. “Do they really need that NOW, or just by next sprint?” Work that used to look interrupt driven under a “chaos plus big projects” process started to look plannable. That helped us control the thrash of “here’s a new urgent request” and resist it breaking the current sprint where possible. Also, the amount of interrupt work varies from day to day but not significantly for a large team over a 1-2 week period. This means that after a couple sprints, people could reliably predict how many points of stories they could pull because they knew how much time got pulled to interrupt work on average. This was the biggest fear of the team in doing sprint planning – that interrupt work would make it impossible to plan – and there was no way to bust through it except for me to insist that we do a couple sprints and reevaluate. Once we’d done some, and people learned to estimate, they got comfortable with it and we’ve been scrumming away since. And the third thing – kanban is harder to do correctly than Scrum. Scrum enforces some structure. I’ve seen a lot of teams that “use kanban” and by that they mean “they do whatever comes to mind, in a completely uncontrolled manner,” indistinguishable from how Ops used to do things. Real kanban is subtle and powerful, and requires a good bit of high level understanding to do correctly. Having a structure helped teach my team how to be agile – they may be ready for kanban in another 6 months or so, perhaps, but right now some guard rails while they learn a lot of other best practices are serving us well. After the traditional explanation (several times) about what story points are, people started to get it. We used planningpoker.com for the actual voting – it’s a bit buggy but free, and since sprint planning was also 15 people on both (or more) sides of a Webex, it was invaluable. This is our 6th and following sprints; you see how our average velocity was still increasing (a bit spikily) but in that last sprint we finally got to where we weren’t overpromising and underdelivering, which was an important milestone I congratulated the team on. Nowadays their committed/completed numbers are always very close, which is a sign of maturity. Just Add Devs – False Start! After the holiday rush, they asked me and another manager, Kelly, to take over the dev side of PRR as well, so we had the whole ball of wax (doubling the number of people I was managing). We tried to move them straight to full Scrum and also DevOps the team up using the embedded ops engineer model we were using on the other 2.0 teams. PRR is big enough there were enough people for four subteams, so we divided up the group into four sprint teams, assigned a couple ops engineers to each one, and said “Go!”. This went over pretty much like a lead balloon. It was too much change too fast. Most of the developers were not used to Agile, and trying to mentor four teams at once was difficult. Combined with that was the fact that most of the ops staff was remote in Ukraine, what happened was each Austin-BV-employee-led team didn’t really consider “those ops guys” part of their team (I look around from my desk and see four other devs but don’t see the ops people… Therefore they’re not on my team.) And that ops team was used to working as one team and they didn’t really segment themselves along those lines meaningfully either. Since they were mostly remote, it was hard to break that habit. We tried to manage that for a little while, but finally we had to step back and try again. Check back soon for Scrum for Operations: Just Add DevOps, where I reveal how we got Agile and DevOps to work for us after all! So far in this series, I’ve introduced the basics of Scrum as it generally is used and explained the practices that make it extremely successful. But that’s for developers, right? If you are in operations, what does this mean to you? How do you fit in? For an ops person, the major challenges are mental – you have to reorient your way of thinking, and then things drop into place very well. I’m writing from the perspective of a Web operations guy, though I’ve done more traditional sysadmin work and managed infrastructure (and dev) teams over time (and started off as a dev, many years ago). Some of my terminology is oriented towards creating a product and keeping a Web site up, but you should be able to conceptually substitute your own kind of system, just as all different kinds of developers, not just Web developers, use and benefit from agile. First, “DevOps.” Get an Ops person assigned to the dev team. This is fundamental – if it’s an externalized relationship, where the dev team is making requests of your “Infrastructure org”, you will not be seen as part of the team and your effectiveness will be extremely diminished. You need to be more or less dedicated to this project, not handling it from some shared work queue. This reinforces the fundamental values of Agile. You join the team, and you dedicate yourself to the overall success of the product you are working on. It is this integration, and the trust that arises from shared goals, that will remove a lot of the traditional roadblocks you are used to facing when dealing with a dev team. A real agile team should have similarly embedded product, QA, and UX folks, it’s not a new idea. You are not “a UNIX guy” or “A DBA” any more. You are “a member of the Ratings and Reviews team,” and you happen to have a technical specialty. This may seem like sophistry but it’s actually one of the most critical parts of this cultural transformation. Start thinking of tasks in a customer-feature-facing kind of way for the backlog. For example, no one but you wants to hear about “configuring the SAN,” they want to know that at the end of the sprint “customers will be able to save files to persistent storage.” If what you’re doing doesn’t have any benefit to the end customer – why are you doing it again? You shouldn’t be. You will be challenged (and this is good) on items that are “monkey work.” “I need to go delete log files off that server, so it doesn’t crash.” Hey, why are we doing that? Why is it manual? Should we have a story for proper log rotation? Need a developer to help? You will see a virtuous cycle develop to “fix things right.” Most of the devs haven’t seen a lot of the demeaning stuff you’re asked to do, and they’ll try to help fix it. I’ll be honest, the first time I was confronted with the prospect of breaking up systems work into sprints I thought it was very unlikely it could be done. “Things are either short interrupts or long projects, right, that doesn’t make any sense.” And then I did it, and the scales dropped from my eyes. Remember refactoring. Developers doing agile are used to refactoring, while we are used to only having “one bite at the apple” – if we don’t get the systems all 100% right before we unleash the developers on them, then we won’t be able to change them later right? Wrong! In a certain sense, sprint planning is a big load off from traditional planning. Infrastructure folks are used to being asked to provide a granular task breakdown and timeline of 6 months worth of work for some big-bang implementation. Then when reality causes the plan to deviate from that, everyone freaks. Agile takes horizon planning and institutionalizes it – you only need to be able to specifically plan your next 2 (or so) weeks, and if you can’t do that you need to try harder. What can you implement in 2 weeks that has some kind of value? Get a Tomcat running sprint 1, then tune it sprint 2, then monitor it sprint 3 – don’t bundle everything up into one huge mass. Figure out what unit tests mean to you for things you are implementing. “Nothing” is the wrong answer. If you’re making a network change, for example, there is something you can do to test that short of “waiting for people to complain.” If you are installing tomcat on a server – if you’re using a framework like chef or puppet they’ll have testing options built in, but even if not there’s certain things you can do to ensure its functionality instead of passing it on and causing lost time and rework when someone else finds out it’s not working right. More to come, meditate upon those truths for a bit – ask questions in the comments! Welcome to the second installment in Scrum for Operations, a series where I talk about (and go through) the process of doing systems work as part of a DevOps team according to the Scrum methodology. Last time, I introduced the basics of Scrum as it generally is used, and its key benefit of frequently delivering useful functionality. But I already hear the objections – “How can that turn out all right?” It is so light on process that one’s initial inclination is to dismiss it as “cowboy coding”, and we already know not to be “cowboy sysadmins,” right? One’s intuition might be (and mine was in the beginning, I’ll be honest) that this would lead to a metastable process that could not be sustainable without fundamental fatal flaws overtaking it. Well, as I learned after trying to learn more and kicking the tires with our dev team here, there are several core disciplines that are agile’s saving graces. We ops guys are used to testing being a neglected afterthought in the development process, often tossed over the wall to a QA team that isn’t well integrated into the product. Therefore we have a hard time trusting code that’s being handed over to us given our experience – we get it handed to us and it doesn’t work! Well, agile pretty much understands that without pervasive testing, this kind of fast cycle process is doomed. At its extreme, some practitioners use Test Driven, aka Test First, development where failing tests must be written first and then code filled in behind it till the test passes. This creates a large inherent test framework. Similarly, acceptance testing (automated continuous testing of user stories vs the code) is a common part of agile. Continuous ongoing testing ensures quality through the dev cycle and reduces the need for time-intensive, and mysteriously always insufficient, big-cycle regression testing. This is a great culture. And there’s all kinds of different tests – unit test, integration/functional/regression testing, performance testing, fault testing… Starting to get interesting to you? How about monitoring? In reality application monitoring is a special case of testing – it’s a “lightweight integration regression test.” Our initial approach to DevOps includes making test coverage goals for things like monitors and performance testing, because that plugs into the existing agile mindset well. Bonus new terminology thing – the quick acceptance test you do upon release, which we always called “critical path testing,” is now being called “smoke testing” by the hip. Update your dictionaries! A side note on formal QA groups. Just as we are working on DevOps, there has been previous work on how QA teams interact with agile dev teams, and there are a variety of different doctrines on how to split the work – often, it’s devs that are responsible for a lot of the testing. It’s a hard balance – you want the devs to be responsible for some of the testing because the best testing is “close to the code,” but just like with Ops, a real QA team has expertise beyond what a developer can just bolt in with 10% of their attention. Here, we have a dev team and also a remote QA team; devs test their own code on the daily build and then there’s a weekly push to a more stable environment where the QA team does acceptance testing and is moving into performance testing and the like. And this is for you to do as well! There’s a whole post or series of posts in the topic “What does a unit test mean for something infrastructurey” – it is incumbent on you to figure it out and also have high test coverage with your work. This is one of the scariest parts for an ops person – we assume that we get one “bite at the apple”, and once we’ve set up the systems and let in the developers, we’ll never be allowed to change anything without a fight. But developers have this problem internally all the time – one dev is working on a core library or API that other developers are using, and they don’t wait for core guy to get done before they start. Instead, they have adopted a concept they call refactoring. Refactoring just means that each sprint, you are open to redoing fundamental stuff that needs to change (or that you realize you did kinda ghetto in the first place). Because this is an accepted part of the iterative approach, you get to leverage this as well.First iteration they get the basic Tomcat and mySQL install out of the repo, and they can get started – and then in the second iteration you front it with Apache, or tune the DB for security, or whatnot and they have to make some changes to fit. I’m not promising no one will ever cry about this, but it’s a part of what makes the culture successful so it’s there for you to leverage. And for you to adhere to! Be open to refactoring your infrastructure based on the emerging project needs. A developer might not even mention this, and most books on agile don’t, because to them it’s so fundamental a discipline that it’s like breathing air. Sadly the same can not be said of Ops folks, so I’m mentioning it. When code is changed, it is in a shared source control repository – which gives other people on the group visibility into it (a collaboration touchpoint), is a common place to source it from (a deployment touchpoint), and can be used to easily manage multiple versions, even experimental ones, and merge or roll back changes. This is the most fundamental empowering technology of modern software development (not just agile) and you must uptake it immediately or you have lost. Fair warning. It is the stepping stone that will allow subsequent Cool DevOps Automation to happen. These three disciplines convert agile/Scrum from dangerous free-for-all to a new technique that gets your product done both more quickly and with higher quality than a waterfall method. I’ll talk further next time about how Ops slots into all this, and how you can fit your systems admin work into a Scrum mindset. Also note, there’s some other agile disciplines surrounding agile design and encapsulation and patterns and whatnot, which I don’t understand well enough yet to speak authoritatively on. Feel free and chime in with other core disciplines if you are! It’s not a mandatory part of DevOps, but I believe that DevOps works a lot better if operations teams adopt Agile. But all that most systems teams know about Agile is that “it’s that thing that makes the development teams not plan worth a damn any more.” Well, though there may be some truth to that, a well run agile process is very effective and not uncontrolled at all. Constructing and maintaining infrastructure in an agile manner is very possible – we’ve done it. In the beginning it seems daunting, just as it did initially to the legions of software developers who were steeped in waterfall based thinking, but once you adopt it I think you’ll see a lot of traditional pain points get a lot better – that was our experience. This is the first in a series of posts about using Scrum for Web operations, and I thought I’d start with explaining what Scrum is from an ops guy’s point of view. Scrum is one of the more popular agile methodologies. Agile was initially defined by the Agile Manifesto and from there got turned into more specific implementations of its principles, methods, and practices, and Scrum is one of those more specific prescriptions on how to “do” agile. Other methodologies have been used for DevOps – like check out this great presentation on how Stephen Nelson-Smith (@LordCope) did a XP DevOps implementation at a British government agency. While developing our first two products that we delivered on the cloud using DevOps, we used an “agile-ish” methodology, which is to say not a formal agile approach. This time, we’ve decided to run Scrum by the book, not just for the feature developers but for our systems engineers, operations staff, security engineers, and system automation developers. Some folks are talking about hybrid models like Scrumban (Scrum + Kanban/Lean) to better incorporate ops work, but we’re going to start with Scrum first and see where we get to. As a system administrator, that’s scary, because we don’t know Scrum. But Scrum is pretty darn simple. Here’s two short videos that give a pretty good intro to Scrum. But if like me you think videos are not an efficient method of conveying information, here’s the short form. Of course in a mid to large sized organization there are other stakeholders, like customers and management and legal and whatnot. But you form a team that has everything it needs to complete its work. All needed features are brainstormed and put into a master list of features called a “product backlog.” This backlog contains everything – including your systems tasks. The backlog is then broken up into smaller chunks, like release backlogs (features targeted for a specific release) and sprint backlogs (specific tasks for a sprint). The sprint backlog is basically your work breakdown structure, if you’re more comfortable with that terminology, except that the tasks are worded more in terms of what feature they provide instead of in terms of what specific things you need to do; this fosters communication with the product owner. The developers (and, ideally, operations staff) on the team help generate the backlog and provide time estimates in hours for each task. The product owner owns the prioritization and ordering (as constrained by things that are actual dependencies). As the scrum, or sprint, progresses, there are daily “standups” – 15 minute meetings where everyone stands up, reports what they have done since the last standup, what they plan to accomplish by the next standup, and any roadblocks they are encountering. By keeping this meeting short it doesn’t waste time, but by having an actual face to face meeting you get very rapid and effective collaboration that cannot be achieved via managing project plans, sending emails, generating status reports, or the like. It cuts out all the busywork and keeps the kernel of coordination that lets a team keep up velocity. 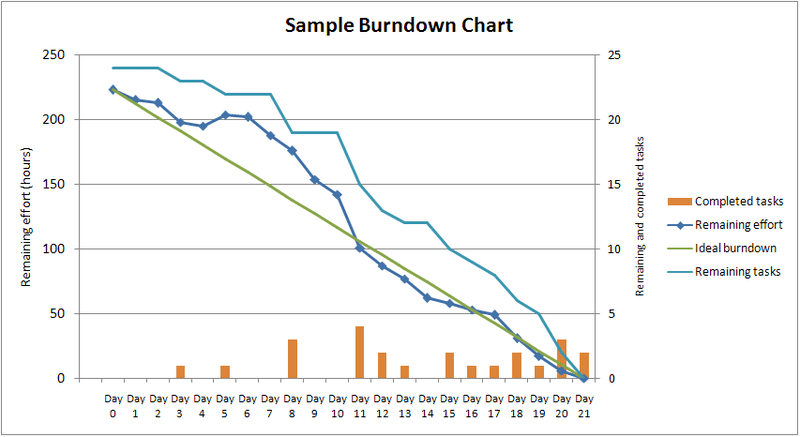 The progress of the team against the sprint backlog is tracked by a “burndown chart.” As each team member completes their tasks for the sprint you can easily see whether you are on track for successful completion or not. And that’s Scrum in a nutshell. Five things. Small integrated team, backlog, sprints, standups, burndown. I’ll talk about each of these areas more in depth later in the series, as we go through them ourselves as we develop a real product, and explain how a system administrator (aka systems engineer, infrastructure admin, operations ninja) can fit their work into this structure. But first, I will explain why Agile/Scrum is not just “crazy talk.” To a hardened system admin, or really to anyone used to working in a waterfall environment, it is very counterintuitive that this approach doesn’t just degenerate into the IT equivalent of orcs pillaging a city. But agile has several interesting practices that make it work, and should be very interesting to an operations person.